U.S. Milk production payment methodology can be segmented into four different categories. The largest is the Federal Milk Marketing Order (FMMO) component payment system which was used to calculate payment for 54% of the milk production in 2009. This is the method of payment that is most closely followed in this blog. This is the only pricing model which pays specifically for pounds of protein in the milk. #124 Pacific Northwest representing 7,470 million pounds of milk or 4% of the U.S. milk. Pricing for these FMMOs is defined as follows by the USDA. "The component pricing system is used in seven orders (orders 1, 30, 32, 33, 124, 126, and 135 (disbanded)). Under this system, producer prices are based on the value of components, butterfat, protein, and other solids, in the milk they market and the value of the producer price differential." Pricing under various parameters can be calculated for these FMMOs at the website milkpay.com. In the other FMMOs, which are largely fluid milk areas, milk is paid based on the cwt of skim milk plus pounds of butterfat. 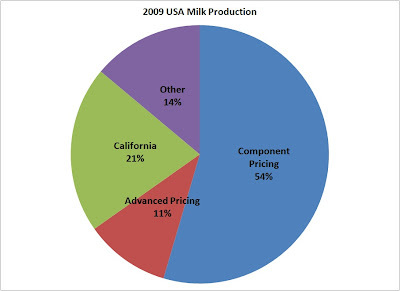 "The skim milk/butterfat pricing system is used in four orders (orders 5, 6, 7, and 131). Under this system, producer prices are based on the uniform skim milk price and the uniform butterfat price. " The complete description of FMMO pricing can be viewed on the USDA site. The advanced pricing is done in advance as the name implies. It is based on two weeks of data preceding the month of payment. Therefore, the most recent pricing is for March 2010. The most recent pricing can be viewed at Announcement of Advanced Prices for March, 2010 . The component pricing is calculated in arrears and posted at the end of each period. The most recent pricing is for January, 2010. The most recent pricing can be viewed at Announcement of Class II, III, IV and Component for January, 2010 . The timing of these announcements is based on a 4-4-5 week basis. The 2010 schedule for announcements can be viewed at this link. They announcement are always on a Friday. One of the confusing points is the calculation of FMMO pricing. Formulas for both the advanced and component payment systems are essentially the same. The 2010 price formulas can be view at this link. While the calculations are essentially the same and are based on the same parameters (cheese, butter and dry whey), the timing of the input parameters and the producer payment system are quite different as mentioned above. California was originally a FMMO as well. However, in a court case, the milk in California was proven to be intrastate commerce and not interstate commerce and therefore could not be managed by the USDA. The California Pricing Model has many of the same characteristics as the FMMO pricing. The value of protein is based on the Chicago Mercantile Exchange (CME) pricing while the FMMO protein value is based on the wider National Agricultural Statistical Survey (NASS) pricing. The California system does not pay specifically for protein. It pays for "solids not fat" (SNF) and therefore, lactose is worth as much as protein. Overall, the California system pays at a lower price that the FMMO pricing system. In all cases, the pricing system represents a minimal price paid for milk. Cheese producers frequently offer a premium for protein above the minimal price to encourage high protein levels. If there are any questions or areas that could use some additional explanation, please use the comment feature in the blog to leave those remarks.